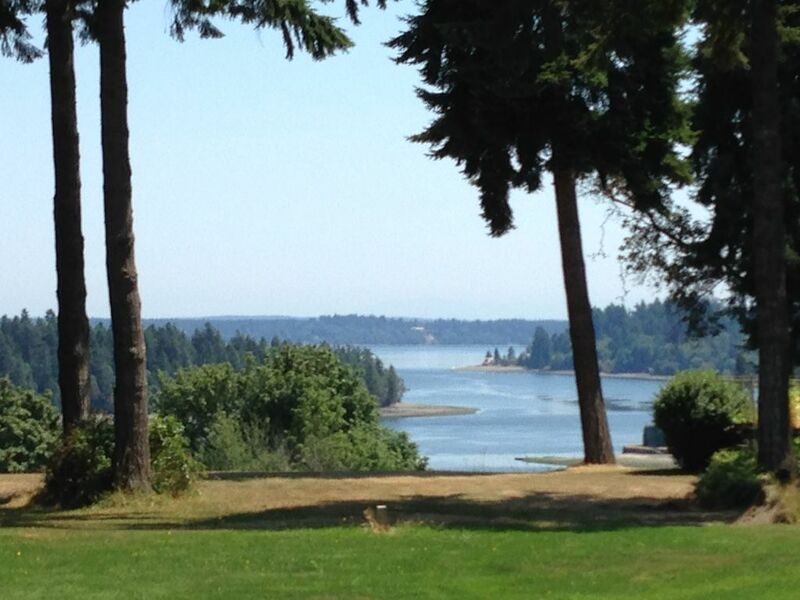 The Dawnview Retreat is about 17 miles north of Olympia and 7 miles from Shelton, in the Arcadia Point area. This home is perfect for a family weekend, girlfriend getaway, or a couples' vacation. It comfortably sleeps 6 adults in beds and will accommodate a child or two in the portable crib and/or on the sectional sofa. The huge second-floor master bedroom suite has a king bed, sitting area, 40" TV, and an en suite master bath with jetted tub. On the main floor are two bedrooms, one with a lovely four-poster queen bed and the other bedroom with two twin beds.. The huge living room is designed for relaxing, putting your feet up and chatting with good friends. The spacious TV loft not only also has a great view of the water, but it also has a pool table and a large sectional sofa for watching satellite TV, movies (DVD collection provided), or playing games. WiFi is provided, of course. The new heating/AC system ensures that you will be comfortable in any season. The large kitchen, with its beautiful hardwood floor and stainless steel appliances, is set up nicely for cooking, with a refrigerator with ice maker, microwave, range, dishwasher, toaster oven, coffee maker, blender, mixer, electric teapot, crock pot, and brand new cookware, as well as a new propane grill on the deck just outside the dining area. Speaking of which, the dining table seats 8, along with 4 additional seats on bar stools at the kitchen counter. There are plenty of dishes (three sets, each service for 12+ -- yes, the owners are pretty much foodies! ), silverware, glasses, and serving pieces. Near the kitchen, the laundry room has a large sink, washer, dryer, drying rack, and is stoked with laundry soap and fabric softener. A single-bay attached garage and covered carport are available, along with plenty of parking space. Peaceful is the best word to describe Dawnview. Its setting in a quiet rural neighborhood is the perfect place to get some rest and relaxation and to base your exploration of the beautiful Pacific Northwest. In five minutes, you can be beachcombing on the Puget Sound, with kayak and boat rentals as close as Shelton (seven miles away). In 10 minutes or so, you can be touring the Walter Dacon winery or Taylor Shellfish or golfing. In about half an hour you can be in the Olympic National Park or the Capitol State Forest (with loads of hiking and riding trails) or exploring downtown Olympia. There is an almost tangible feeling of serenity when you turn onto the long, beautiful private driveway to Dawnview (please slow down and enjoy the scenery and abide by the 10 mph posted speed limit). The canopy of maples and evergreen, flanked by a small fern-lined stream, feels like you are entering paradise. Not only is Dawnview a great home base for seeing the Puget Sound area, but it is also the perfect place to relax and unwind. My husband and I fell in love with the Puget Sound area when our son moved there ten years ago. We decided this would be the perfect place to spend our vacations, and we've enjoyed sharing our home with others who also enjoy the peaceful energy of the beautiful Pacific Northwest. After looking at many properties, Dawnview struck a chord with its peaceful setting and beautiful water views. Our home is very clean and comfortable -- much more of a relaxing retreat than a party place. Most of our furnishings are new, the home is kept exceptionally clean, and we believe that it is the perfect place to decompress and enjoy the surroundings. Home is situated in a small rural development with six other homes on very large, wooded lots. On a clear day, gorgeous view of Mt. Ranier from the south side of the property. Beautiful view of the Puget Sound from living room, TV loft, guest bedroom, and master bedroom. Basics for cooking: flour, sugar, spices, coffee, tea, hot cocoa mix, etc. Two kayaks available; must coordinate with owner. The house is lovely and was a perfect get away for a few friend's and our kids. There was a lot to do. Went to the boat dock/shell beach, took walks and saw deer, played board games, cards, and billiards, and just sat on the porch and enjoyed a cocktail! The kitchen and bathrooms are well stocked. Kathy was a pleasure to work with! We would highly recommend this VRBO. Our family had a relaxing and enjoyable time. Thank you! We had a wonderful experience at this home. We were there to provide a recovery atmosphere for our daughter who had just had surgery and it couldn’t have been a better place to accomplish that. The care of the property is amazing and the attention to detail has been very thoughtful and personal. We hope that we will have the opportunity to visit again. Very peaceful, relaxing anniversary experience! Beautiful very relaxing home, that had everything needed to enjoy cooking meals etc at home!. Very clean, extremely comfortable and overall just an amazing environment to relax and enjoy family! It was great. House had everything we needed! Great girls weekend! Not to far to Olympia for a little shopping. We did most of our own cooking! If the rental is cancelled more than 60 days prior to check-in, all monies received will be refunded. If the rental is cancelled more than 30 days prior to check-in, all monies received will be refunded, minus a $100 processing fee. If the rental is cancelled less than 30 days before check-in, the cleaning fee and damage deposit will be refunded and 50% of the rental amount will be refunded.